After meeting with the players, coaches and ownership the Power Hour franchise would like to formally notify both C.A.T.S. and H.O.B.B.I.T.S. that our franchise will not join either side. We here at the Power Hour will not participate in any type a race war. We instead focus our attention on the team that we are currently facing. We feel all races should be equally punished when they find themselves on the pitch against us. We strive to be feared by all races and all teams in the league. We are currently making efforts to improve and developing our players in inventive ways. We know that our star rookie Knob Creek has gained us a lot of attention recently. In the future, our franchise will be fielding many players of many different abilities and mutations. 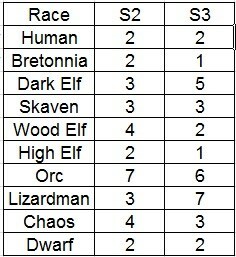 We enjoy that fact that in our league we feature a wide range of races for us to crush. This season was our first chance to face a Skaven team and we enjoyed killing a few of them. This week we will get to punch a bunch of uppity high elves. In following season we look forward facing Bretonnian, Wood Elf, and even Norse teams. That is if the Norse teams ever form a proper team. We will bash all races and creeds. Power Hour Labs have released this information about the recent MML PRO Team break up. Written by: More_Shots on April 12, 2016.